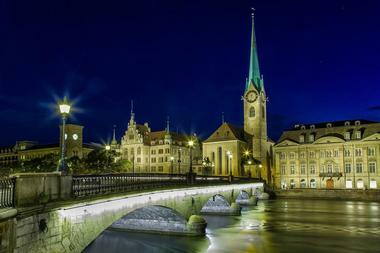 Zurich is a popular tourist destination in Switzerland, both during the summer as well as during the winter. There are nearby snow skiing areas in the Swiss Alps, so winter is a popular season. The temperatures are cold, there are many visitors, and room rates are high. Summer is warm enough to enjoy the city and also warm enough to go swimming in the lake. But again the city is crowded and room rates are high. Spring and fall months and the best times to visit Zurich - the temperatures will be cool, but there will be fewer crowds and room rates will be reasonable. Zurich Weather in January: It’s freezing in Zurich in January with the low temperature averages at a very cold 28°F (-2°C). The city can be likened to a winter sports enthusiast’s dream come true with Swiss Alps at peak condition this month. The high temperature average is also very cold at 36°F (2°C). February the average low temperature holds steady at 28°F (-2°C) as avid skiers and snowboarders continue to flood into town eager to hit the slopes. On the other hand, the average high temperature sees a significant increase to 43°F (6°C). In March, Zurich gets just 4 hours of daily average sunlight making days seem quite short. The high temperature average increases by nearly 10 degrees to 52°F (11°C) while the low temperature average sees a 6-degree jump to 34°F (1°C). April offers some amazing deals in Zurich with the peak season dying down. The average high temperature increases to 59°F (15°C) while the average low temperature bumps up to 37°F (3°C). Zurich Weather in May: It’s the last month to catch some of the best deals in Zurich as May. This spring season brings in an average high and average low temperature ranging from 68°F (20°C) to 45°F (7°C). Precipitation averages are moderately low for Zurich at 90 mm. In June, the low temperature average sees a steep rise to 52°F (11°C). Meanwhile, the first month of summer brings in a high temperature average of 70°F (21°C). July is the hottest month of the year and also the sunniest. With a 7-hour daily average of sunshine, Zurich receives a matching average high temperature of 75°F (24°C). Meanwhile, the average low temperature is 55°F (13°C). In August the low temperature average remains the same at 55°F (13°C). The high temperature average, on the other hand, decreases 2 degrees to 73°F (23°C). Additionally, August receives the highest precipitation average of the year with 120 mm of rainfall expected. Zurich Weather in September: Fall arrives in Zurich in September with the average low and average high temperatures measuring in at 50°F (10°C) and 68°F (20°C) respectively. October is the driest month of the year with just 70 mm of rainfall to be expected. The weather gets even cooler this month with the low temperature average dropping to 45°F (7°C). The high temperature average decreases by over 10 degrees to 57°F (14°C). In November the average high temperature and the average low temperature measure in at 45°F (7°C) and 36°F (2°C) respectively as fall nears its end. December brings in the winter season as well as a daily average sunlight rate of 1 hour. Meanwhile, the average low temperature and the average high temperature both decrease by 6 degrees. 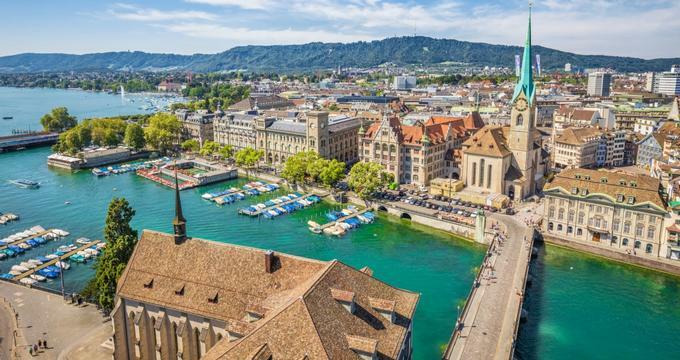 As the largest city in the incredible country of Switzerland, there’s no question that Zurich gets a tons of tourists exploring the city every year. 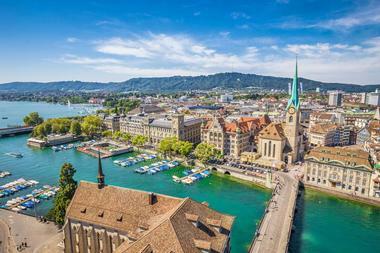 If you’re planning on making Zurich your next vacation destination, the time that you visit depends on what in particular you want to experience in this city. To experience the best temperature that Zurich has to offer, plan your trip between June and August. These months are also the ideal time to visit for those who want to spend time vacationing by the lakes. For cultural events like the Zurich Film Festival and the Contemporary Art Fair, plan your trip in between September to October. December to February are the months that beckon snowboarder and skiers from the around the world as the Swiss Alps are at the optimal condition for exciting winter sports. 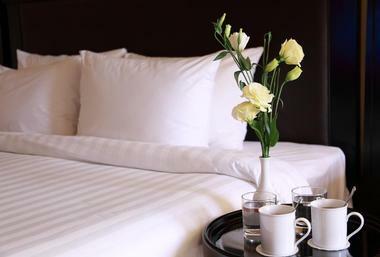 To enjoy the best deals and rates in town, visit in between March and May. If you arrive by airplane you will land at the Zurich Airport which is also known as the Kloten Airport. It is the largest international airport in Switzerland, one of the ten busiest airports in Europe, and the hub of the Swiss International Air Lines. 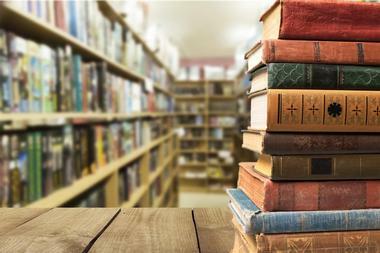 It is located approximately seven miles north of downtown Zurich. Many people enjoy traveling by train in Europe: there are trains from all over Europe that arrive at the main railway station called the Zurich Hauptbahnhof. Arriving in Zurich by bus is another option. One fun way to arrive is by boat: there are passenger ships and old steamers that cross Lake Zurich to Zurich from Rapperswil and other cities. There are several ways to get from the Zurich Airport into the city. The Car Rental Center is located on Level 1 of the Airport Center: it is about a ten minute walk from the terminal. It is recommended that you reserve your car in advance of your trip. Trains run from the airport to the main train station in Zurich in about ten minutes: they depart the airport every five to ten minutes. Line 10 of the streetcar system takes about 35 minutes but you can enjoy the sights along the way. You can also get to the city center by shuttle bus or by taxi. A visit to one of the offices of the Zurich Tourism Tourist Service is a very helpful way to start your stay in Zurich. The friendly and professional staff members are happy to help visitors with their questions about what to see and do, where to eat, where to shop, where to stay, and how to navigate the city. There is an office at the main train station and one at the Port of Rapperswil on Lake Zurich. The tourist service offers maps, brochures, and several kinds of transportation cards. You can also buy tickets for visiting things like the zoo and museums. Zurich is blessed with a very efficient and convenient public transportation system. It is called the Zurich Public Transport (VBZ) and it is made up of boats, buses, cable cars, trains, and trams. 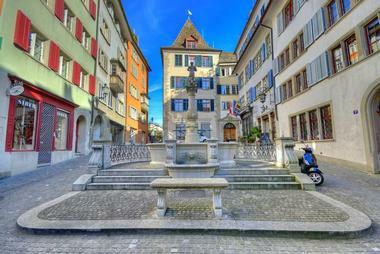 This system helps visitors get around the city as well as some of the areas outside of Zurich. The trams are especially helpful and are easy to use: just make sure you buy your ticket before you board. You can buy single tickets or day passes. The VBZ works on a zone fare system so it is helpful to know what zone you are departing from, and what the zone of your destination is. In addition to the great public transportation, there are other ways to get around Zurich. Many of the city’s attractions are close to each other, so walking is one of the best ways to explore Zurich. Walking is also the best way to navigate the cobblestone streets and weaving alleys of Zurich’s Old Town. Riding a bicycle is also a good way to see the sights. The city of Zurich offers free daily bicycle rentals: all you need is to show your passport and pay a small refundable deposit. Driving a car is not a good way to see Zurich: the traffic is heavy and parking is scarce. Taxis are expensive and unnecessary because of the public transportation system. Zurich has many restaurants and it is a good city if you want to try traditional Swiss cuisine as well an international fare. Some of the traditional dishes include rosti which are grated and fried potatoes; Zuri-Gschnatzlets which is veal prepared in a mushroom and white wine cream sauce; and Kutteln nach Zurcherart which is tripe with mushrooms, caraway seeds, and white wine. 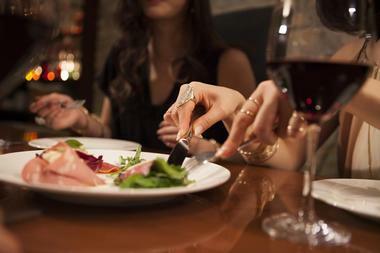 White wine is often served with fish from Lake Zurich: the white Riesling Sylvaner is a favorite. Another popular wine is Clevner made from blue Burgundy grapes that grow around the lake. And don’t forget to try the cheese fondue! Zurich has several options for those visitors interested in doing some shopping during their visit. In the center of the city there is a shopping area near the train station that includes exclusive high-end shops: this area is located along a street called Bahnhofstrasse. Slightly less expensive shops can be found at the other end of this street at Bahnhofplatz. ShopVille is a large complex of stores underground in this central shopping area. 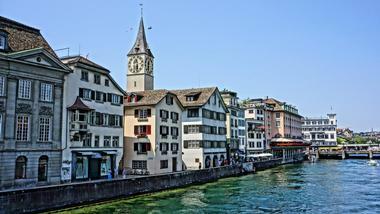 There are quaint shops and boutiques in Zurich’s Old Town. The shopping center at the airport and the stores at Zurich’s main train station are open every day of the year. Zurich sits along the banks of Lake Zurich in northern Switzerland. The city is made up of 12 Kreise, or Districts. Kreis 1 is the district that will be of most interest to visitors: it is where the Limmat River flows into Lake Zurich. 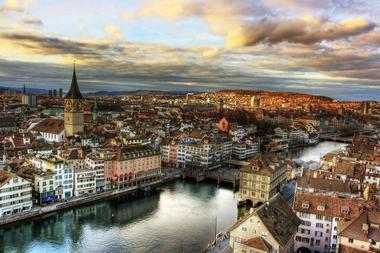 The Limmat River divides Zurich into two parts: the western side of the city and the eastern side. In Kreis 1 you will find Zurich’s Old Town, the Minster of Our Lady Church, the twin-towered Great Minster, several museums, and the Lindenhof park. Kreis 2 sits along the lake and is known for its vibrant nightlife. Kreise 4 and 5 have many art galleries and are also known for their club scenes. 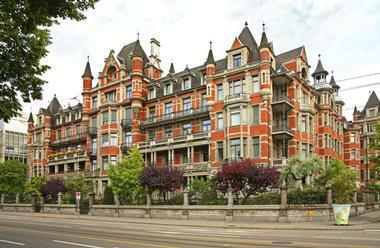 Zurich is a beautiful city with outstanding choices for wedding venues. If you want to get married in Switzerland, at least one of you must be a legal resident of the country at the time of the marriage. If you meet this requirement, then you submit a marriage application to the civil register office. 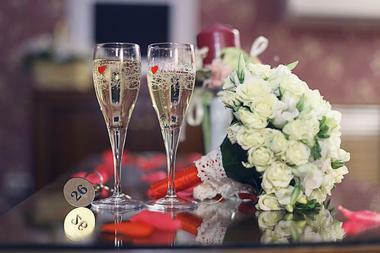 After the civil ceremony you are free to have a second ceremony at the location of your choice. Some of the top hotels for weddings include the Radisson Blue Hotel Zurich Airport, the Sheraton Zurich Hotel, and the Romantik Seehotel Sonne with its three restaurants and views of Lake Zurich. There are many different kinds of accommodations that you will find in Zurich from five star hotels to simple guesthouses. Zurich hotels are often filled with business travelers, so it’s a good idea to try to book your accommodations as early as possible. Some of the top hotels include the Atlantis by Giardino, the Hotel Baur au Lac which opened in 1844, the Hotel Eden au Lac, the Dolder Grand, the Widder Hotel, and many more. Bed and breakfasts are less expensive and some choices are the Bed and Breakfast Villa Feldpausch, the Bed and Breakfast Kalin, and the Bed and Breakfast Sea View.